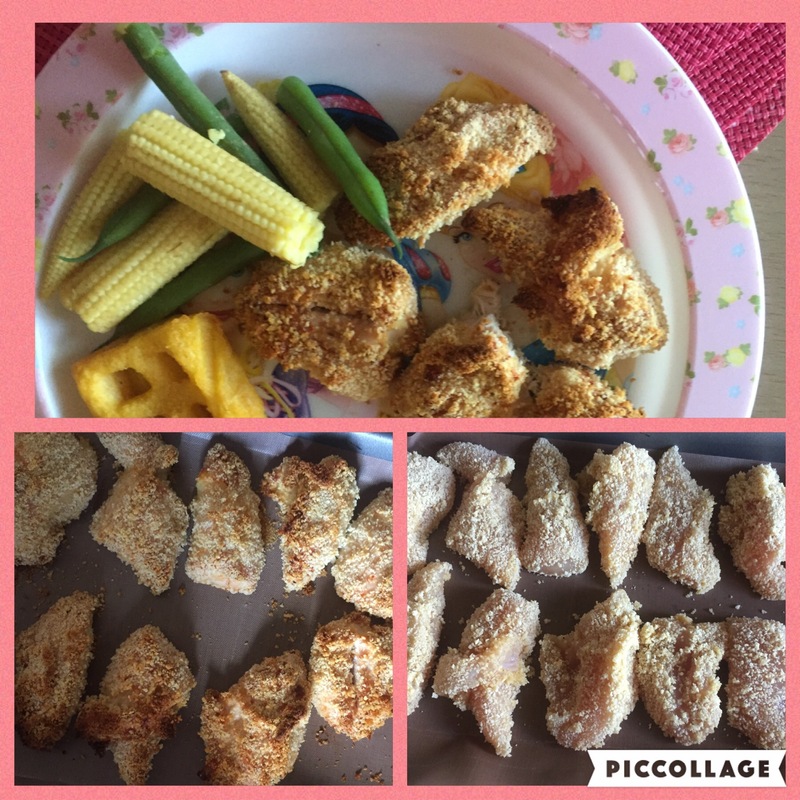 On Friday I told you all I’d be making home made chicken strips for the kids. If you ask our kids what they want or fancy for dinner it’s always chicken nuggets and something, and I feel bad always saying no so I decided to see just how easy it was to make them myself, then I know exactly what’s in them and I know they are ok for the kids to eat! They were so easy to make, I literally went and bought some skinless mini chicken fillets and cut them all in half so they were little strips, I whisked an egg and whizzed up some breadcrumbs with my hand blender thingy. You can buy ready made breadcrumbs from Any supermarket and they come in a tub like gravy! I dipped the raw chicken in the egg, then rolled in the breadcrumbs then lined them up on a baking tray. ( I have reusable baking tray paper if you don’t you’ll have to grease the tray to prevent them sticking). I put the oven on gas mark 6 and cooked for about 20 minutes but just kept checking on them untill they were golden and the chicken was cooked through. Served up with some carrot and potato waffles and some fresh veg and bam dinner done! The kids loved them with some ketchup and cleared their plates, and I had the satisfaction to know what they were eating was good for them and not filled with processed crap! Took all but 5-10 mins to make and 20 mins to cook! Previous A couple of my favourite dishes! Next Corset braided bun- lace braided bun!